Art on a plate at L’air du Temps in Belgium. What is the right way to take photos of food in restaurants? Many of us have stories and anecdotes of group dinners gone bad. I’ve heard so many anecdotes from friends and experienced a few that this article could have easily been one I wrote. It might actually tempt me to share a few funny stories in the coming weeks about group dinners gone bad. So if you have any, don’t hesitate to drop us a line. In the meantime, enjoy this article published in the Guardian. Most of today’s top UK chefs have had stints with Marco Pierre White. He was the most influential and creative chef of his generation before he decided to retire from actual cooking in 1999. Here is a great interview with him in which he speaks about celebrity chefs. He also makes some interesting points about being able to do what he wants because he does not have ‘three Michelin stars tying him to his stove’. We love Tokyo and hope to return as soon as this is feasibly possible. 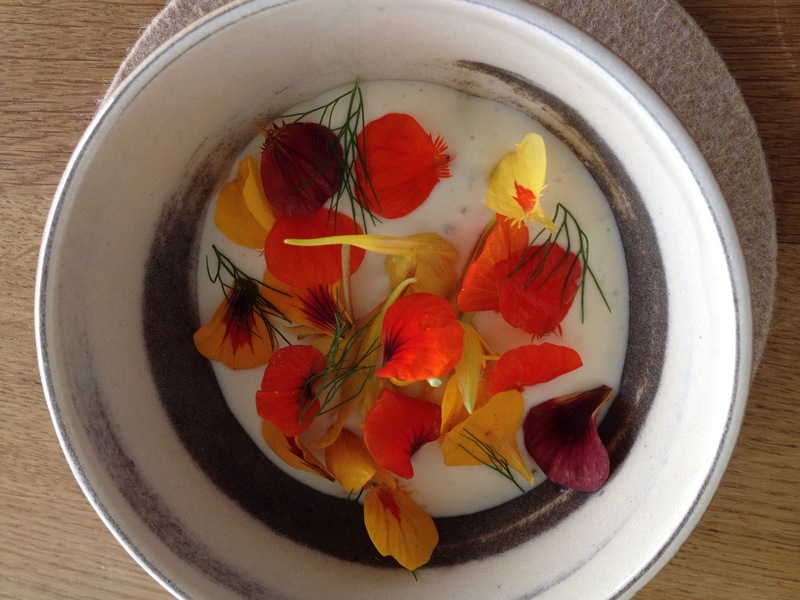 Noma’s chef Rene Redzepi has been in Tokyo over the past weeks cooking at a pop-up restaurant. Here is a guide to eating in Japan’s capital city. And to finish off with Redzepi’s adventure in Tokyo, you might want to read a behind the scenes account of what happened when Noma moved to Tokyo. Joe Warwick writes a great piece for The Independent after spending time working in the pop-up restaurant. When I am serving dinner I have an obsession with ensuring that it is served piping hot. I actually hate it when I am served food that is cooling down. So I have a love hate relationship with taking photos of food at table. Sometimes it is necessary to document a meal, and photos are always necessary in blogs. I also like to ask chefs what they think about people taking photos in their restaurants. Here, Heston Blumenthal is cracking down on snapshots at the table. He has quietly introduced a strict photography policy at his British restaurants which includes not using flash photography and guests shifting around the dishes and standing to shoot a photo. We think there has to be a way to have the best of both worlds. How about restaurants providing customers with photos of the dishes they have served? If there is one article you should read this week, then make it this one. It is a shocking read about the surprising truth of what we eat. It is written by Joanna Blythman and is a preview to a book being published next week called: Swallow This: Serving Up the Food Industry’s Darkest Secrets. It makes for scary reading. And in Cambridge they have developed a chocolate which can reduce wrinkles. Have you ever considered why more and more people seem to be gluten intolerant. Now there is a wheat scientist who has a different view as to what the problem could be. The problem may actually be in modern baking. If you ever wondered what it takes to be a food critic you may want to read the following article. New York Times restaurant critic Pete Wells gives a view of how he does his job. Culinary Journeys is a new series of monthly half-hour shows on CNN which explores a different destination through the dish or cuisine that has helped put it on the map. The first episode features Massimo Bottura, of Osteria Francesana in Modena. It will be shown on 6 March at 4.30pm (GMT), 5.30pm (CET). Grant Achatz speaks about how Bocuse d’Or is influencing chefs. The culinary competition organised in Lyon features epic cooking by 24 teams from all over the world competing for the prestigious gold statue created by the legendary French chef Paul Bocuse. And to finish the round-up we leave you with a list of the best places to eat (trattorie) in Naples, Italy. It is in Italian but worth noting particularly if you intend to visit this Southern Italian city. So many food for thoughts!